The big picture for Open Data Policies Decoded: Helping cities leverage data-driven policy remix – Open Data Aha! Sunlight recently announced Open Data Policies Decoded, a new web resource developed in partnership with the OpenGov Foundation to help connect great policy solutions to the open data initiatives and public officials that need them. We are excited about the site — now in public beta — and optimistic about the immediate value we think it brings by addressing the problem of open data policy that isn’t open. But there is a bigger picture here as well: We see Open Data Policies Decoded as the first step toward a more empirical and analytical approach to open government advocacy and technical assistance, as well as a pilot project for a new set of tools aimed at supporting a culture of policy remix for open government reforms. Along with the America Decoded project from our friends at the OpenGov Foundation, another place from which we’ve drawn inspiration is the work of the Comparative Constitutions Project (CCP) and its Constitute tool. According to CCP Co-director Zachary Elkins, Constitute is “a highly indexed repository of the world’s constitutions, designed to operate hand-and-glove with Google Docs.” Constitute allows constitutional drafters from across the globe to “comb the world’s constitutions, extract relevant ideas, and export the ideas to [Google] Docs.” A collaborative group of reformers can then “propose, discuss, and revise” these relevant ideas to form “the basis of discussion for other drafters around the world,” in a process given a nice overview in this Youtube video. We’re opening up open data policies across the country. 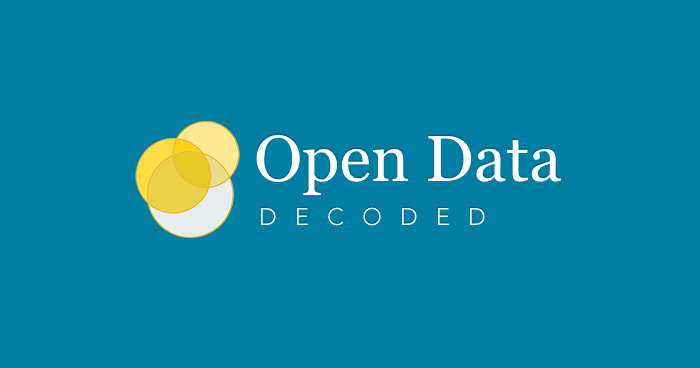 Check out Open Data Policies Decoded, our new project with OpenGov Foundation. To be clear, you can’t currently use Open Data Policies Decoded to seamlessly export relevant passages to a collaborative word processing tool — you’ll have to do some basic searching, downloading, and copy-pasting to achieve a similar result — but ideas like this are certainly on the radar going forward. In fact, this process of building on the success of other governments in drafting important policy reforms resonates with an idea we’ve had: an “open data policy wizard.” This can lower the barriers for participation even further, enabling anyone to expertly analyze and compare open data policy across jurisdictions, and to remix and remake good ideas to fit the new context of a different city. In order to build such an open data policy wizard, we will need to index and analyze open data policy text in more detail than we have for this first stage of Open Data Policies Decoded, in much the same way that CCP has analyzed constitutional texts. We’re excited to take on that task. Structured open legislative data not only permits easier searching, mixing-and-matching and tweaking of policy, it also allows for a more thorough understanding of policy as well. Beyond the advanced search and export features of Constitute, CCP also helps inform the decisions made by constitutional drafters with empirical analysis of structured textual data. CCP’s use of natural language processing and semantic tagging in their global repository of constitutional texts has enabled impressive analytics, including timelines, rankings and visualizations that reveal useful insights for both scholars and for those who are drafting or amending constitutions. For instance, one can glean insights about just how common certain practices are — for example, the provision of a constitutional right to bear arms (surprisingly, at least for an American like myself, not very common) — and insights about how good ideas — like, say, the concept of fundamental human rights — have spread from constitution to constitution across various jurisdictions. Empowering insights like these for open government reforms is another aspiration of ours, and with Open Data Policies Decoded, we are also closer to achieving this goal for open data policy — but there’s certainly more work to be done to get all the way there. This isn’t just about opening open data policy though. We hope to add analytical insights and streamlined policy drafting functionality to Open Data Policies Decoded in the future, and if all goes well, this approach will serve as a model for our policy reform work more broadly. We hope to facilitate an online community of practice around not just open data policies, but the various other open government reform policies about which Sunlight cares deeply: public records law, open meetings acts, campaign finance policy, lobbyist disclosure requirements, open contracting policy, etc. Open government makes sense, and it should be easy to learn from the jurisdictions that are doing it well to advocate for it in your community — and not just passively or abstractly, but by actively drafting the concrete solutions you want to see. Sunlight is excited about the prospect of our continued work bringing us closer to a world where anyone can take advantage of good reform ideas to advance open government objectives. But beyond open data policy, and beyond even open government policy more broadly defined is a future where any issue is open for participatory reform thanks to open legislative data and the opportunities for read/write/remix that this kind of data affords. Sunlight’s mission is to advance government transparency and accountability, so we are interested in the open government policies most relevant to that mission. However, the Open Data Policies Decoded project is also meant as a demonstration of what could be done with any issue facing cities, not just with the open government issues that Sunlight cares about most. It’s not so hard to imagine urban planners taking this same “policy as open data” approach with an aggregated repository of zoning ordinances to better understand what works in land use regulation, helping those good ideas spread on a “Zoning Ordinances Decoded” site forked from ours; or to imagine environmental advocates and sustainability offices taking this same approach to energy policy or climate resiliency plans. For any issue, there are stakeholders both inside and outside of government who care about getting it right, and treating policy as open data can tap this energy to help find the solutions that are working and to help those solutions spread to the jurisdictions that need them. This vision for the future — one where everyone is empowered to read, write and remix the rules — is only possible with open legislative data as the norm, not the exception, in cities and towns everywhere. Better open data policy and practice — now more easily accessible for reuse in new jurisdictions thanks to Open Data Policies Decoded — can help encourage the open data initiatives needed to get us there.